STREETSBLOG USA raps up the results of more than 2 years of debate over the stretch along Broadway from Euclid to Country Club in a poignant editorial called Pima County Holds Better Sidewalks Hostage to Get a Road Expansion. Many should agree with the gist of this conclusion. Broadway’s 2nd to last bottleneck settles for 6 lanes at a political and cultural cost. The last bottleneck is the snarly entrance into downtown. Yes, we are stuck with that. 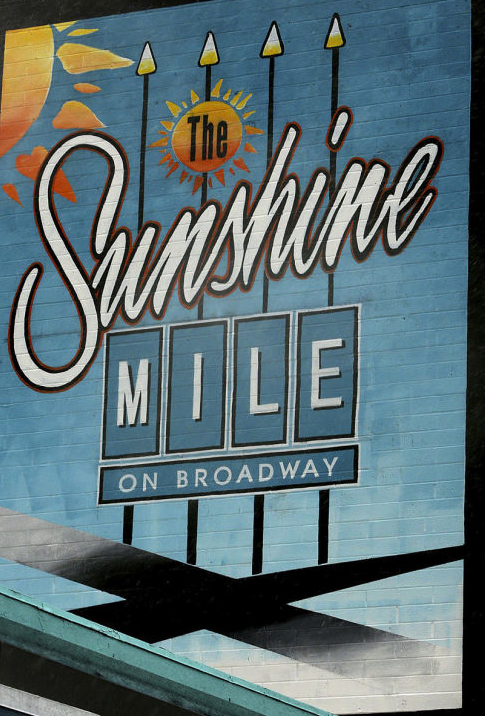 Sunshine Mile RIP. Like many important cultural attributes of Tucson heritage, what perpetuates cultural losses to new development is a lack of community design engagement. Many things could have happened on the Sunshine Mile, but the resolve to engage was not a factor in the outcome. Not even a 2 1/2 year task force protocol can overcome having its creative juices drained by abasing civic duty and hidden agendas. Read the article for a quick summary of what we have moving forward with somewhat of a blank slate. How America’s 4th largest city can abandon its addiction to cars – Salon.com. Broadway Widening; Transit modes or more of the same? After nearly two decades in economic limbo, the Sunshine Mile should be a lighthouse for new transportation alternatives but as the CFT session get closer to a design conclusion, it is not clear the final design will be any more than just another 6 lane road project. The Citizen’s Task Force (CTF) dearly wants to tear open the minds of RTA leadership, however, as reality set in, it becomes evident that funding has many strings attached to results. See Chuck Huckelberry’s memorandum of 5/8/14: Memo. The ward 6 newsletter tracks this process, now 18 months long. You can see it in Excerpts. You should also view the Broadway Coalition Report Citizens and surrounding neighborhood leaders has been a large influence in pushing for balance. Midtown resident, JD Garcia offers a guest editorial; Broadway is not a Corridor to Somewhere Else., that is a valuable summary of the corridors history and what would be good for it. The Broadway Corridor plan is undergoing evaluation by the Broadway Task Force in an effort adjust the scope to something that fits Broadway. It is a long-delayed plan with many completed commercial building acquisitions. These structures are tagged for demolition and damage business incentive along a key stretch of Broadway. It is a long standing problem. View the full article in Demolition Dilemma,Tucson Weekly by Tim Vanderpool.